The Colombian Amazon, 1909. German ethnologist Théo Von Martius (Jan Bijvoet) enlists shaman Karamakate (Niblio Torres) to help him find the mythical yakruna plant, which he hopes will cure his sickness. In return, Von Martius pledges to deliver Karamakate to the last of his people, the Cohiuano, from whom he has been separated since white Europeans descended to colonise the area. Ciro Guerra's film, shot in austere black-and-white, recounts their journey upriver into the heart of the rainforest while simultaneously telling the story of the older Karamakate (Antonio Bolivar) agreeing to take a second explorer, American botanist Evan (Brionne Davis), on the same quest in 1940. Works as varied as Joseph Conrad's Heart of Darkness (1899), Ruggero Deodato's Cannibal Holocaust (1980), Werner Herzog's Fitzcarraldo (1982) and Roland Joffe's The Mission (1986) have all addressed madness in the jungle from the point-of-view of white outsiders, typically presenting the locals as unknowable stoic mystics. 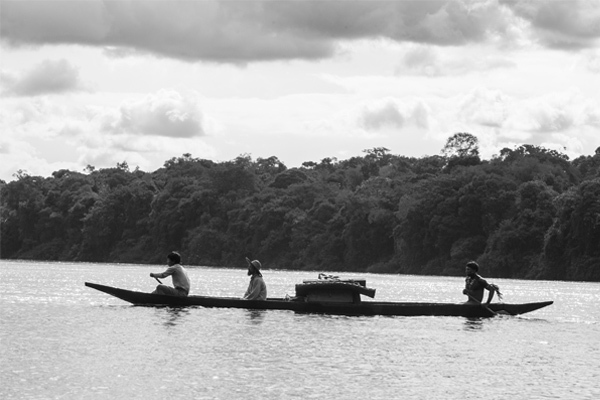 In Embrace of the Serpent, Guerra gives us the native perspective on colonial misadventure. Through Karamakate's eyes we see the human cost of capitalist exploitation. His own tribe have been disbanded, others, like Théo's native assistant Manduca (Yauenkü Migue), have been stripped of their traditional vestments and suffered violence at the hands of brutal rubber barons. Théo and Karamakate witness a Catholic missionary sadistically beating his boy converts and denying them their own language, followed by drugged-up soldiers conducting bloody skirmishes in a border war with Peru. In the later timeline, that same mission has been seized by a Kurtzian imposter with a messiah complex, who has turned it into a base for his degenerate suicide cult, a venue for orgies and bogus primalism. Even Evan wants the yakruna to help the US war effort, it transpires. Much more than an indictment of white intervention in the Amazon, Embrace of the Serpent is also about the interaction between two conflicting, seemingly irreconcilable conceptions of the natural world: native spirituality versus western rationalism. Karamakate treats Théo's inept attempt to paddle their canoe with disdain, disgusted that the European should be so tone-deaf to the rhythm of the current. Later, he sneers at Evan's belief that the river only has two sides, knowing the real answer is infinite. The question of material goods brings out further philosophical disputes between the travellers. Théo is reluctant to leave his compass behind when indigenous tribesmen covert it, fearing the instrument will ultimately cause them to forget how to navigate by the stars, an idea scotched by Karamakate, who argues that he has no right to deny them the fruits of enlightenment. The shaman later encourages his employer to unburden himself of his luggage - literally weighing them down in the water - on the grounds that white men are too obsessed with possessions and ownership, clinging to their blinkered faith in physical reality. Théo counters that the journals and photographs his crates contain are the only means humanity has of securing a record of rare cultures, an idea the older Karamakate, burdened by legacy as the last of the Cohiuanos, comes to appreciate, carving his people's accumulated customs and teachings into the rockface for fear they will otherwise be lost with his failing memory. Embrace of the Serpent proves to be a hallucinatory trip in several senses, a heartfelt, thoughtful and poetic undertaking, with Guerra particularly well served by Torres and Bolivar, whose understated performances together instil Karamakate with real depth and complexity. Seek it out.